The World Communion of Reformed Churches (WCRC) encourages strong participation to promote gender equality on the 107th International Women’s Day, 8 March 2018. “This day encourages women to break the silence and fear and to speak up. Today as a World Communion we stand with all the women struggling, whether in the church or in the community around us, and we join their struggle which is our struggle as well,” said Najla Kassab, WCRC president. Gender equality is over 200 years away, according to World Economic Forum’s 2017 Global Gender Gap report. 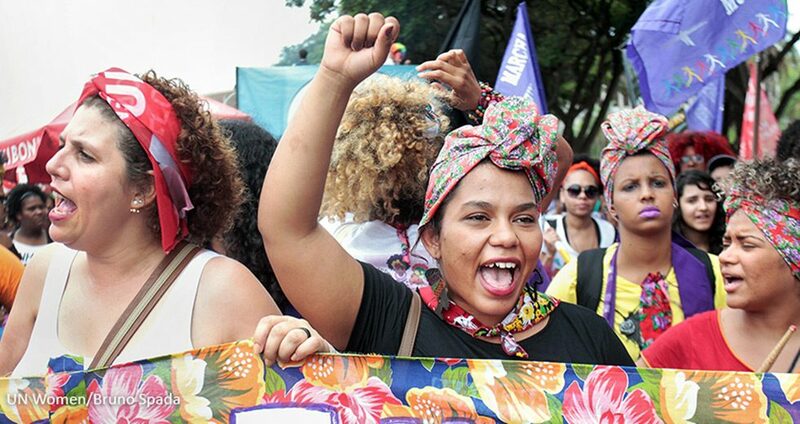 But momentum for gender parity is developing with global activism for women’s equality driven by movements like #MeToo and #TimesUp. “This is a day where the world joins hands to point to practices that dehumanize women,” said Kassab. “It is a day that empowers women to see their value in the eyes of God and to speak up against gender injustice. The WCRC is committed to gender justice through a variey of programmes and projects, including its theological education scholarship for women. “I believe this day is important and serves to underscore that God calls and gifts women for important and significant work in the church and world,” said Vander Wal. The 2017 General Council also instructed the organization to develop a Gender Justice Policy by 2019, collaborating with its regional councils to foster and encourage the use of this policy as the practice of the whole communion of churches, delineating issues of gender-based violence within church and society. International Women’s Day is a commemoration and a strong call to action to press forward gender inclusivity. The theme for this year’s International Women’s Day is a strong call to #PressforProgress, motivating and uniting whole communities globally.